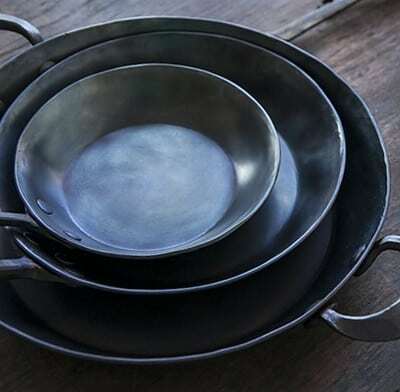 Searching for the best hard anodized cookware? I know how difficult it can be to find the right cookware for your kitchen, and that's why I've done the legwork for you. 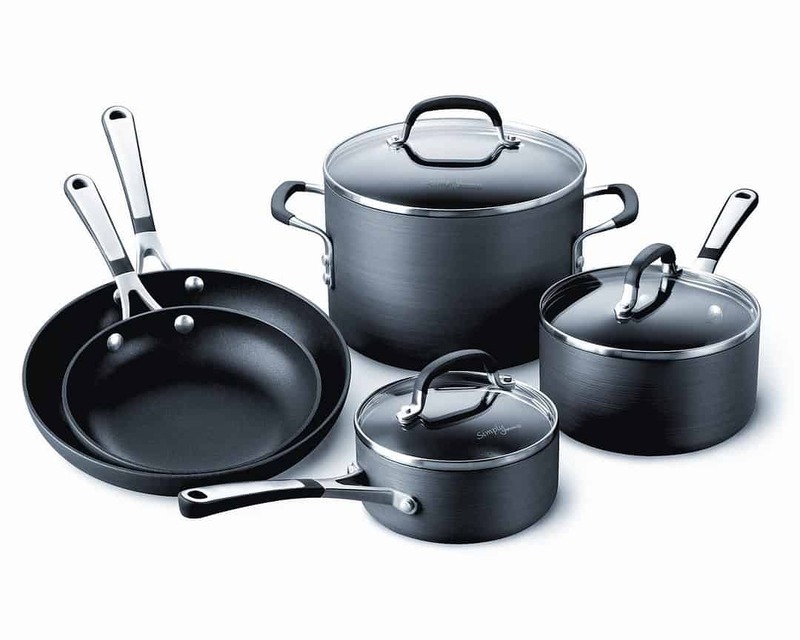 I'll give you some tips on how to select the right cookware based on your needs, some traps to avoid, and the characteristics to look for when selecting the best hard anodized cookware. I'll also introduce you to some of my top picks so that you can choose a set to meet your personal cooking needs. 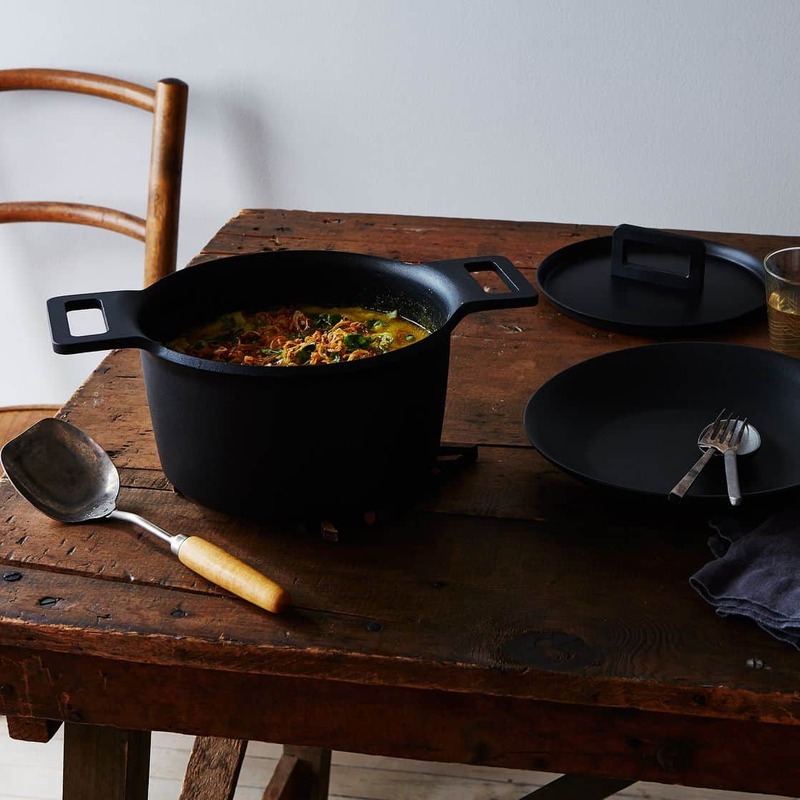 The right cookware can make a real difference in the kitchen, so let's get started exploring the best options for you. Why Use Anodized Cookware in Your Kitchen? Anodize﻿﻿d﻿﻿ ﻿﻿﻿﻿﻿cookware is safer than non-anodized cookware. When you buy non-anodized aluminum, you're getting cookware that has the potential to leach chemicals into your food. These pots are typically heavy; they feel solid and appear as if they are forged from a single sheet of metal. Many cooks like to use Teflon in their cooking since it prevents food from sticking. However, Teflon contains chemicals from the PFC family, and these chemicals have been shown to be highly toxic. The EPA is considering banning these chemicals due to potential harm to childhood immunity and the risk of arthritis. Anodized cookware is a great option for cooks who want to use a safe option in their cooking. This type of cookware is made by placing the metal in a chemical solution to create a hard, non-reactive surface. It results in a product that is able to prevent leaching and lasts for a long period of time. The best hard anodized cookware isn't always the most expensive cookware. When you limit your choices to how much an item costs, you tend to start overlooking other factors like your cooking style, the type of range you're using, and whether you really need a set that's going to add another frying pan to your collection. When you're building your set from scratch, it's important to consider how much value you're actually getting in a set. When you purchase a set, sometimes the lid or even the cookbook will count as part of the set. So rather than receiving eight pieces of cookware, you're often left with six pieces of cookware and a couple of low-value accessories. If convenience is a factor for you, check to see that the cookware can be placed in the dishwasher; you'll find that most cookware is not dishwasher safe. Anodized cookware doesn't have to be treated with kid gloves, but it's typically not recommended to put it in the wash. If you can adjust the settings of your dishwasher, some smaller pots and pans can be placed on the top shelf without causing harm. Consider the type of cooking you do on a regular basis before going out and buying your next set of cookware. Anodized cookware is suitable for a range of applications, but make sure your cookware is going to meet your needs before you go out and buy a complete set. Anodized cookware is extremely versatile, and you can use it in most applications. It's great for people who want to use their cookware with any set of ingredients without worrying about how the ingredients may damage the pan. Another benefit is that you don't have to season the cookware. If you come across naysayers who tell you that aluminum cookware is harmful, you need to remember that you're getting anodized aluminum cookware. This is different from aluminum cookware that can leach aluminum salts into your cooking. The process of anodizing traps the aluminum and prevents it from leaching into your food. If you've settled on anodized cookware, then the biggest decision has already been made for you. Aluminum is a good conductor of heat, which is essential for cooking your food evenly. When evaluating your cookware choices, use a few simple criteria to make sure you get the best hard anodized cookware for your situation. The first consideration is your budget. Purchase the best set you can afford. If it's a little more than what you wanted to spend, hold off until you can afford the nice set. Cookware is an investment that will last for years. Get the essentials before you start thinking about other options. You must have a small nonstick skillet, a medium skillet, a stockpot, a sauté pan and a saucepan. Make sure a lid comes with each piece. Finally, don't be afraid to look around and buy each item individually. This may end up costing you more in the long run, but you have to think of this purchase as an investment. It's better to spend the extra money now and get exactly what you want than spend more money down the road for missing items. This high-end Cuisinart cookware set is well suited for many home cooks because it covers the basics with durable materials that will help keep your food safe from chemical leaching. The brand is known for its line of consumer products designed for the home kitchen. With 17 pieces to choose from, you're getting an outstanding value. 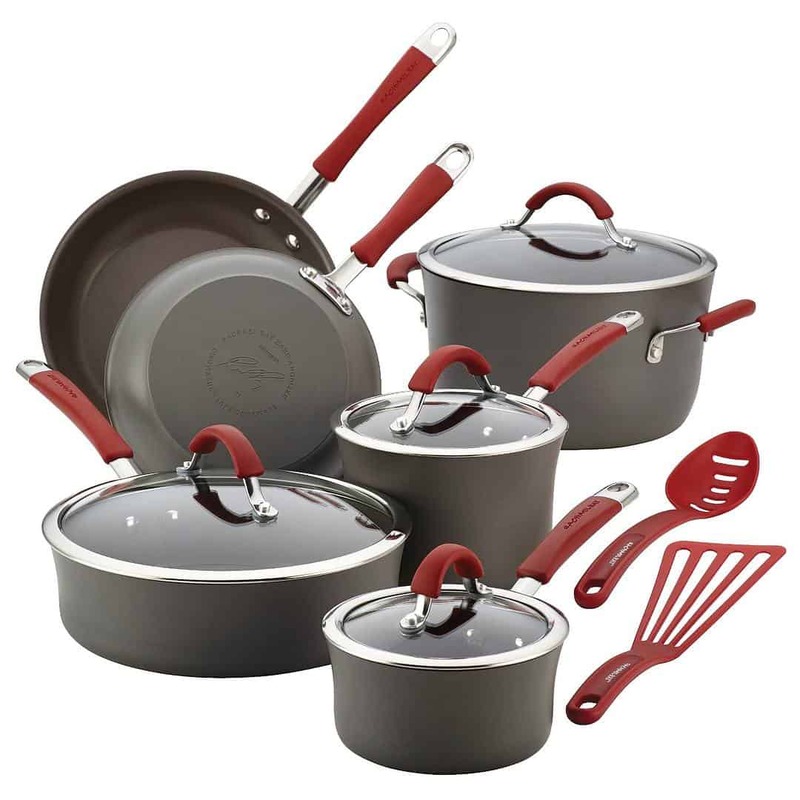 This hard-anodized set boasts sturdy construction thanks to the aluminum core, the riveted stainless-steel handles, and the break-resistant glass lids. The 9.5-inch pasta insert will come as a welcome addition for those who regularly make pasta and are looking for a convenient way to cook it. The unit also comes with a steamer insert so that you can make the perfect steamed vegetables. 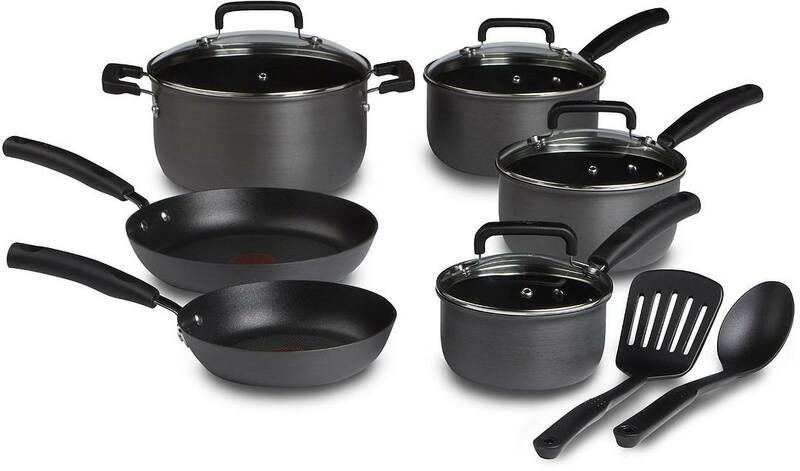 This attractive set comes with a large assortment of pans to stock your kitchen with a complete set of cookware. You'll get 12 pieces that are designed to help you create fantastic meals. The set has a warm, earthy coloring, and you'll love the shatter-resistant glass lids with stainless steel rims that are wide and easy to grip. The only stovetop you shouldn't use these pots with is an induction stove. The pots and lids are also dishwasher safe, which makes it easier than ever to clean up when you're done cooking. The cookware set also bears Rachel Ray's signature on the bottom. These are some heavy-duty pans that will stand the test of time. The T-fal cookware set is designed to give you exceptional value without compromising on the quality of your anodized cookware. You'll get a complete 12-piece set that comes with a spatula and spoon that are specifically designed to prevent scratching the pots and pans.The set comes in a 12-piece, 14-piece or 17-piece arrangement. The 12-piece set comes with two frying pans, a covered Dutch oven, three saucepans, and two utensils. The 17-piece option comes with three frying pans with lids, a griddle, three saucepans, a deep sauté pan, a Dutch oven with lid and a steamer insert with two side handles, and a One Egg Wonder, so you'll get everything you need to cook great meals in the kitchen. There's a lot to like about Calphalon cookware. This set comes with eight pieces, and it has everything you need to cook most meals. You'll get two frying pans, two saucepans and a stockpot. The saucepans and stockpot come with lids. The handles are made of stainless steel, and the silicone accents help keep the handles cool. These pans are safe for use in the oven up to 400 degrees, and you'll enjoy consistent results. When the time comes to cleanup, you'll have no problem wiping down this set of nonstick cookware. This is the perfect beginning set for those who want a cookware that will last a long time. The set looks great, and the pieces are guaranteed to last with a 10-year warranty. 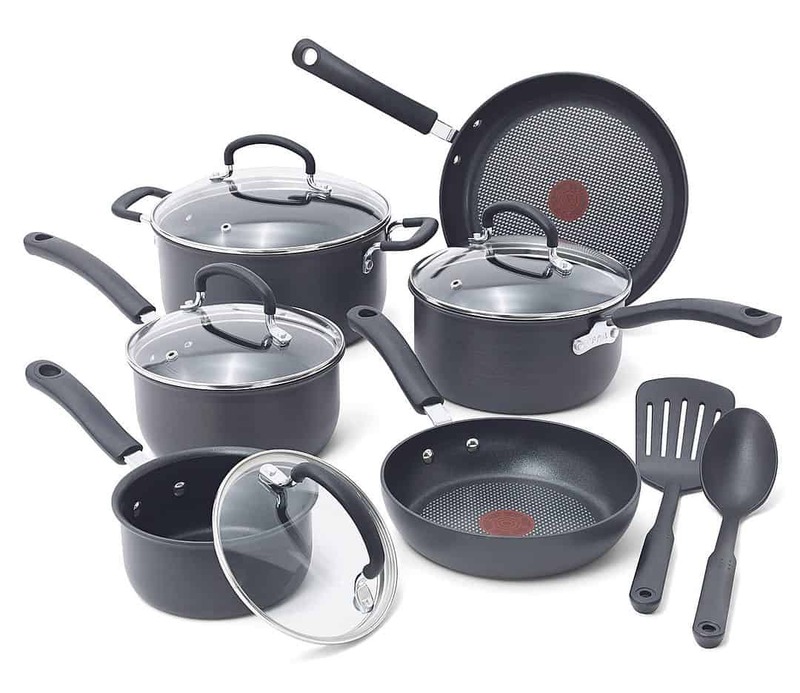 The T-fal Signature set offers a nonstick surface in your choice of regular or titanium materials. This gives you the option to get the same set with a better-quality nonstick surface if you have more room in your budget for premium materials. 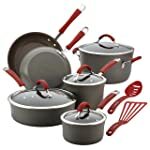 This set is on the lower end of the price range, but the collection of pans still offers a good degree of heat distribution, and the pot and pans can be put in the dishwasher for easy cleaning after your meal. 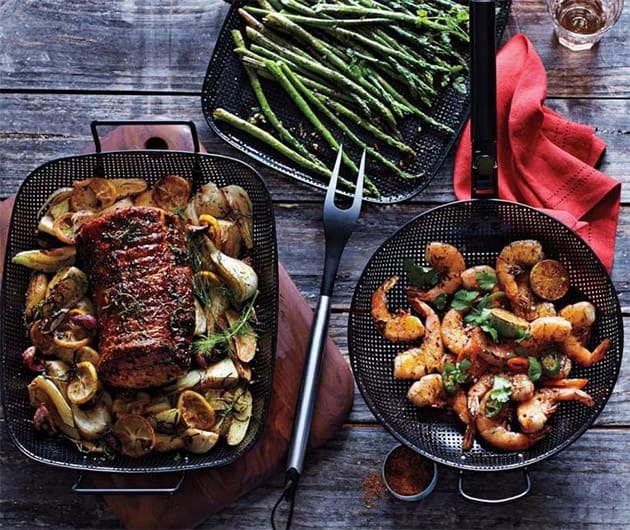 The cookware is oven safe up to 350 degrees if you make dishes that require baking before serving, and you'll enjoy the durable materials that offer a long life and good reliability. With all things considered, I personally like the Calphalon series which is the best out of these five sets. 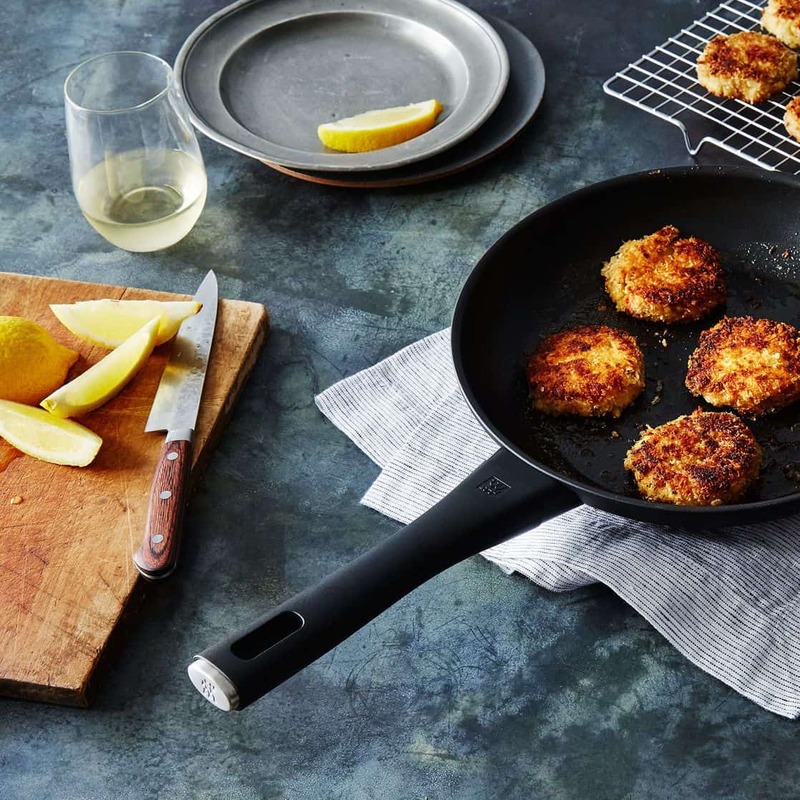 It doesn't have every pot and pan you could possibly need, but Calphalon produces quality products that you can trust in your kitchen for years. 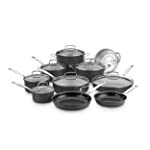 The Calphalon cookware set meets all of my criteria for the best hard anodized cookware, and you'll get a variety of pots, a durable design, and PFOA-free materials designed to keep your food safe. What do you think of my list? Tell me about your favorite cookware in the comments section and share your knowledge with a friend who's shopping for cookware!